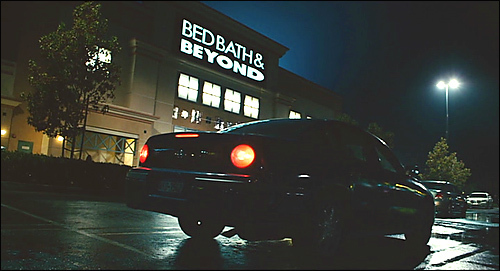 In the 2006 Adam Sandler comedy, "CLICK", the magic begins at a Bed, Bath & Beyond store, where Adam enters their "Beyond" department and is given a magical "universal remote control", which allows him to fast forward through life. If you slow down that moment (and others later in the film), you'll notice that there is a Staples store right next the BB&B, and a McDonald's just up the street, which perfectly matches this Hawthorne branch. But most notably, the Ayres Hotel is also seen in the film, and is right across the street from this BB&B store. You can see an image of that store in the screencap above, taken from the film. And here is an aerial photo of that same Hawthorne store, via Live Local. 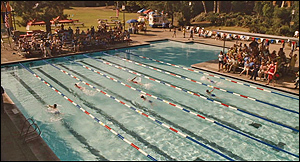 Speaking of "CLICK", the swimming pool scenes in the same movie (where Adam arrives late to his son's swim meet) were shot at UCLA, in the smaller of the two Sunset pools, on the northeast side of the University's Westwood Village campus, in their Sunset Recreation Center (near Hendrick Hall, inside the loop formed by DeNeve Drive). Speaking of "The O.C. ", much of that show, which was supposed to be in Orange County, was actually shot in Redondo Beach, CA. The opposite is true of "LITTLE MISS SUNSHINE", the quirky, Oscar-nominated 2006 comedy. The kiddie beauty pageant is supposed to take place at "The Redondo Suites" in Redondo Beach. But don't go driving around Redondo Beach looking for that hotel, because you won't find it there. Instead, those final hotel scenes (and the pier scene as well) were actuallly shot 75 miles north of Redondo, in Ventura Beach, CA. Remember the scene where the family exits the freeway on a large offramp bridge that circles right past the hotel? Well, that freeway was the Ventura (101) freeway, the exit was near Chestnut Street, and the hotel (called in the film) was actually the Crowne Plaza Ventura Beach hotel, located at 450 Harbor Blvd, in Ventura, CA. The pier (where Dwayne & Frank talk, during the pageant) is actually the historic Ventura Pier, and is located right outside of the Crowne Plaza hotel.